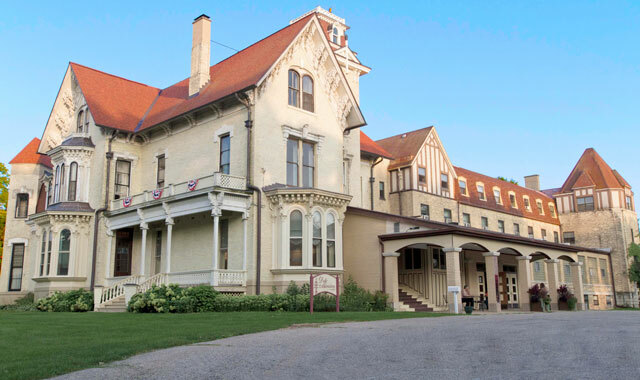 Siobhan Cottone loves to see the smiles of those who visit the Dole Mansion and its adjacent Lakeside building in Crystal Lake. As executive director of the Lakeside Legacy Foundation, which manages the mansion and its 12-acre estate, she’s seen many visitors renewed by the creative energy that permeates this place. One of her favorite stories happened last year, when a group of seniors attended an afternoon concert at the Dole’s Listening Room performance venue. Afterward, she chatted with some of the audience. “I talked to one group of older ladies and one told me, ‘I am just invigorated,’” Cottone says. Someone nearby joked that, perhaps, the women had consumed too much coffee. Visit one of the Dole’s First Friday art events or a concert at the Listening Room, and you’ll feel it. Visit the Dole’s 20 artist studios or enroll your children in a music or dance class here, and you’re likely to experience it, too. “You can’t help but feel stimulated by music, art, and all the creativity that happens here,” says Cottone. This year, the remarkable property is taking on a new identity that builds upon its artistic foundations while reaching into the future. As Cottone sees it, this newly dubbed Lakeside Arts Park at the Dole deserves to become a prime attraction for the region’s business and nonprofit leaders – not to mention the artists, art lovers and dedicated community members who naturally gravitate here. The mainstay Dole Mansion was completed in 1865 as a summer home for the family of Charles Dole, an early member of the Chicago Board of Trade. In the 1920s, an annex (the Lakeside building) was attached to the home as part of the first Country Club of Crystal Lake. By the 1940s, the property had become a preparatory school for boys. Since the Lakeside Legacy Foundation assumed the property in 2002, it’s found many a use for the Dole’s distinctive facility – from the Dole family home to the Lakeside building’s classrooms and gourmet kitchen. There are now 22 culinary classes in that kitchen, including many homeschool kids and clients from McHenry-based Pioneer Center who learn culinary skills here. Dance classes use the spacious Sage Gallery to teach students, age 9 to 99, in dance styles including ballroom, swing and tango. Opportunities also are available for Boy Scouts and Girl Scouts, and groups such as the Northern Illinois Special Recreation Association. Adults also find enlightenment at the monthly First Friday event that draws a wide variety of juried artwork and musical performances. The 100-seat Listening Room welcomes intimate concerts. The arts are alive and well inside the Dole, but what truly distinguishes this property is that it’s completely supported by the community. The nonprofit Lakeside Legacy Foundation receives no government funding; it’s sustained entirely by private donors, fundraising events and volunteer support. The mansion is also supported by the artists who maintain private studios inside and by groups that rent the facility for events. Crowds flock to the mansion grounds for the annual Lakeside Fest every Fourth of July weekend, the Run & Roll for the Dole duathlon in October and the Christmas at the Dole in December. Last year, an inaugural art fair drew more than 1,800 visitors on Labor Day weekend. The event is scheduled again this year. Given the property’s age, facility improvements are an ongoing challenge. Certain repairs to the mansion are needed for preservation and restoration. Because the building has many steps but no elevators, improved handicap accessibility is also needed. With its recent rebranding, Lakeside Arts Park at the Dole is experimenting with other means of engaging the community with its unique facility. New corporate enrichment programs are serving businesses and nonprofit leadership with unique full-day and half-day sessions that use art, cooking, health and motivational programming as a springboard. Try something like the Group Mural Painting, where your team can learn strategic and tactical skills while planning and painting a work of art. Or, engage in some competitive cooking a la “Iron Chef.” Then again, maybe a Nutrition 101 workshop, an express workout seminar or a meditation class are more your pace. It’s entirely possible at Lakeside Arts Park at the Dole. To learn more about upcoming events and programs, facility rental, corporate enrichment sessions or volunteer opportunities, visit lakesideartspark.org. With help from Rhonda Mix. This entry was posted on Wednesday, May 18th, 2016 at 12:00 pm	and is filed under Mind & Spirit, Top Posts. You can follow any responses to this entry through the RSS 2.0 feed. Both comments and pings are currently closed.